While I usually post on Mondays (check in tomorrow for how you can make a difference this week), I had to pop this off to you today. 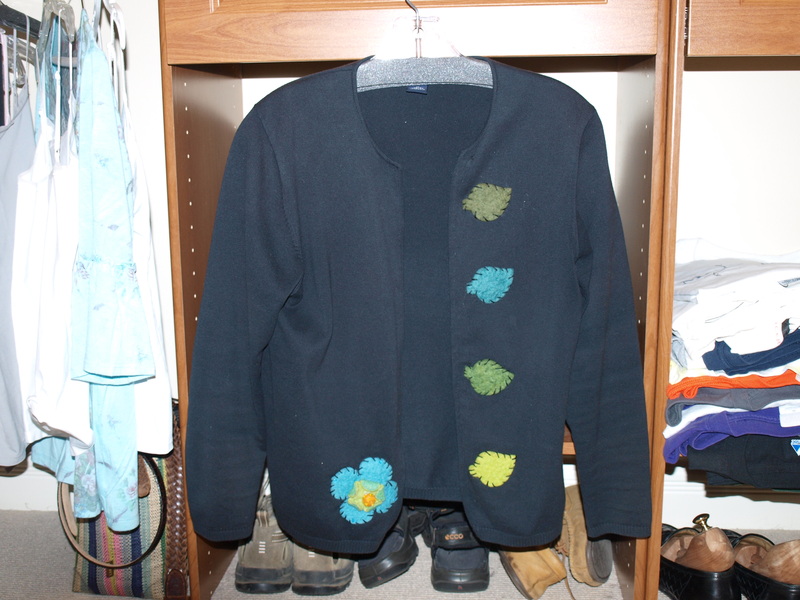 Last week, I wrote about re-purposing clothes (and life). I figured with all the football games on today, some of you may be looking for something to do with your hands while you watch. One of my favorite creative musends (a friend who is also a muse), Colette, sent this picture to share with you on the sweater she made for herself (she is the friend who helped me make my sweater and skirt that I showed you last week.) Check out what she did for herself. This was a turtle neck cut “A Symetrical” with a button added. How cute is that! So, today make it a game to look around and see if anything in your closet could become a new favorite by cutting it up , sewing it differently and adding a little something extra (buttons, felt, ribbons). Not only will you be watching to see who wins a spot at the SuperBowl, you’ll be a winner, too! What did you find to MindFULLY re-purpose today? Let us know! How many bags of things do you have to give away after last Monday’s posting? Wait! Before you get rid of the clothes you moved to the right, take a peek at how my friends Colette and Susan Kramer inspired me to look at my old clothes with new eyes. Both women find old clothes, take them apart and put them back together again. 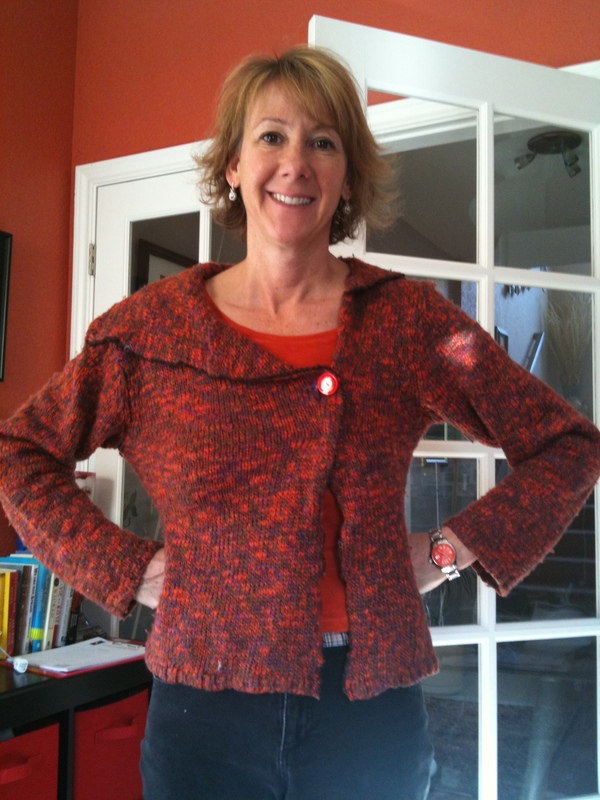 Colette finds sweaters at ARC and does it herself at the kitchen counter with a sewing machine. Susan Kramer finds amazing skirts and dresses at Good Will and takes them to the Russian tailor and turns them into show stopping and classy staples (Her secret? Pearls. She wears them every day – either on her ears, or multiple strands around her neck, or on her wrist – but more on the Kramer later). Yes! You can take that old sweater and make a new one. 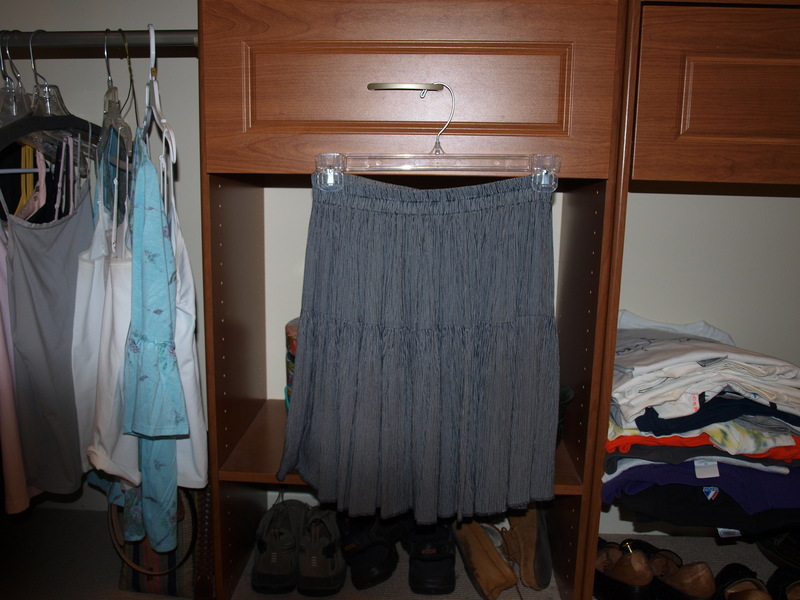 Cut the granny skirt into a short skirt you can wear with tights and boots. Lose the bows on the back of the back of a dress and make it into a jumper. All you need s is a needle and thread or a good tailor. The sweater below is a favorite example. It was a typical black Lands End Cotton sweater. Boring. Colette inspired me to change it up. So, I popped off the buttons, sewed both sides under and ironed them flat. Then with thick thread, I hand-sewed on Felt leaves. Felt anything is easily found at Michaels or Joanne Fabrics. Now, I wear this sweater all the time. The skirt is from Good Will. $4. It went to the floor. Colette cut it off and sewed it right above my knee. I wear it with tights and my sweater. So cute! 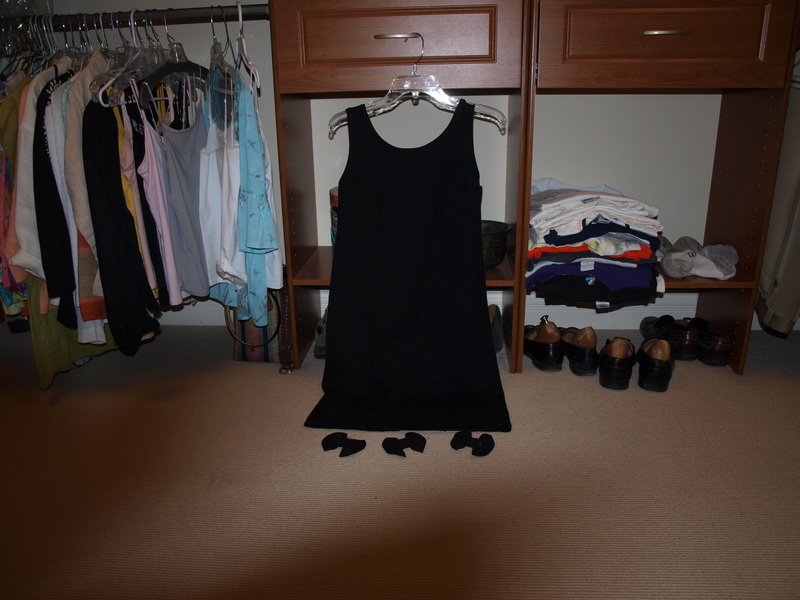 But the crowning glory of my creative repurpose is a black dress I got on the Back Rack at Loehmanns for $10. I looked terrible in it – sleeveless and straight is not a good look for me. But I couldn’t pass it up. So, it hung in my closet til last week, when I saw it through new eyes. I cut off the bows and covered up the leftover threads with a sweater. 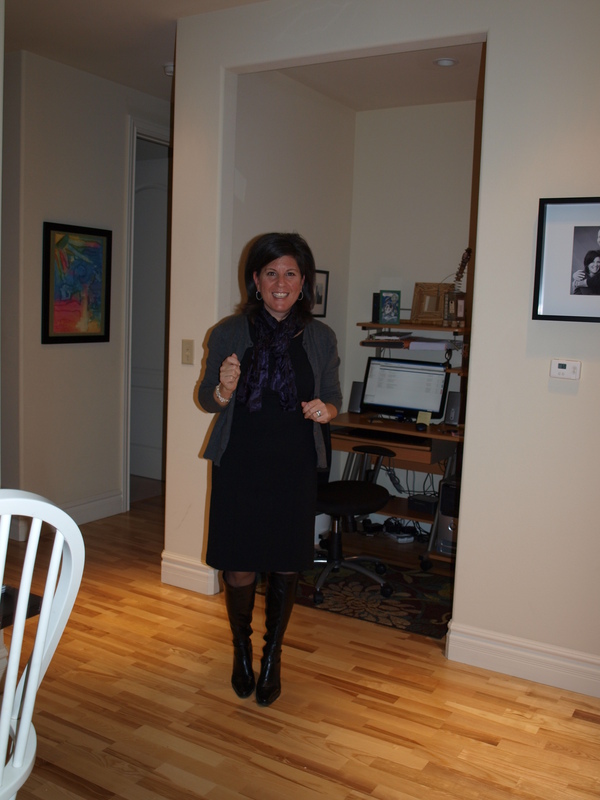 My favorite scarf, a pair of fun tights and black boots gave it a fresh and contemporary look. I wore it twice this week and am taking it to work on Tuesday. It’s my new uniform. So, now that you are moving things in your life to the left and MindFULLY beginning to think about what you are moving to the right, ask yourself how you can repurpose what you have. Maybe you look at a sweater, a relationship or a kitchen pitcher with new eyes. The sweater gets bedazzled, the relationship becomes a resource vs a confidant and the pitcher turn into a colorful flower vase. And be of ease and remember, if what you are looking at doesn’t fit, no matter what you do, then thank it and pass it on. One person’s Good Will bag is another person’s ball gown. What can you MIndFULLY repurpose in your life? Let us know!